I am a soup junkie. I love cooking it and I love eating it. Making soup is generally a pretty forgiving process, allowing you to adapt as you go. It can be a simple, nearly foolproof project perfect for boosting the confidence of a novice cook or a daylong endeavor challenging the creative powers of the more experienced. And eating soup on a cold, windy day is so wonderfully warming and satisfying. With little but cold and windy days this time of year, northeast winters call for lots and lots of soup to warm up body, belly, and soul. This particular soup brings even more warmth to your day with its brilliant red color and the super hot oven you’ll use for roasting the peppers. So if the snow is flying outside your window like it is here, cook up a pot of this roasted pepper deliciousness and I promise it’ll take a bit of that chill out of the air. As I mentioned, one of the reasons I enjoy cooking this soup is that it heats up the kitchen nicely. We keep the heat turned down pretty low in our home so I’ll use any excuse to crank up the oven this time of year. When I make this in the summer, I usually roast the peppers on the grill. Roasting them over a gas burner works great as well. Feel free to use whatever method you prefer. 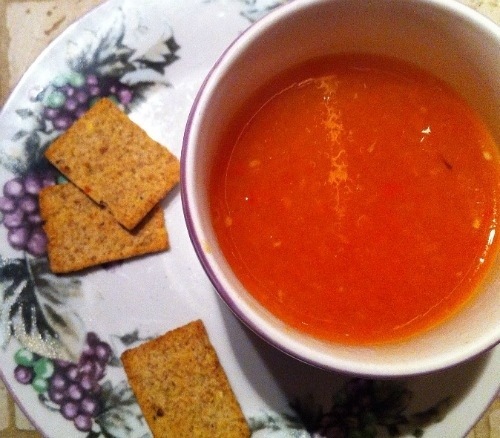 The gouda makes a really nice addition, resulting in cheesy strands swimming throughout the vibrant red soup. It’s still delicious without, but if your diet allows for it I’d highly recommend that you use it. Roast the red peppers. To roast using the broiler, position the peppers in a preheated broiler as close to the heat source as possible. Roast until the skins begin to bubble and blacken, turning the peppers as each side darkens to ensure that they are evenly roasted. Keep an eye on the peppers while they roast, as they can go from beautifully roasted to burnt and unusable fairly quickly. Carefully transfer the peppers to a bowl and cover the bowl with foil or a kitchen towel. Allow the peppers to cool in the covered bowl for 5-10 minutes until they are cool enough to handle. Heat oven to 375 degrees. Roast the garlic cloves on a small cookie sheet with a splash of olive oil until the cloves are softened, about 15 to 20 minutes. Remove from oven and set aside to cool. Alternatively, you could roast the garlic in a toaster oven or in a skillet on the stovetop. Once the peppers have cooled, peel the skin off of each pepper and remove the stem and most of the seeds. Try to do this over a bowl so that you can catch any juices. 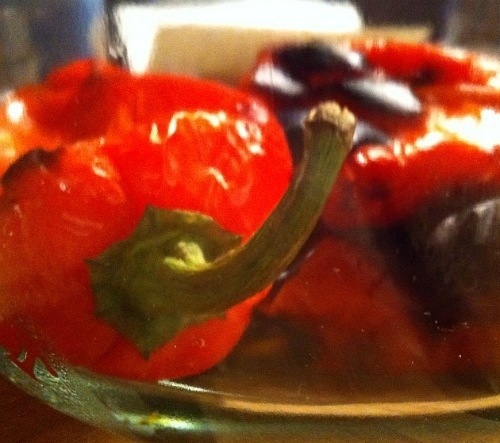 Transfer the roasted peppers and any juices to a food processor or blender. Peel the roasted garlic cloves and add these to the food processor as well. Process until smooth. Heat the 2 T of olive oil in a soup pot or dutch oven over medium heat. Pour the pepper puree into the pot and cook, stirring frequently, for a few minutes. Add the paprika and 1 tsp of the salt. Stir to combine. Add the stock and bring to a simmer. Allow the soup to simmer for 5-8 minutes. Taste, and add the remaining 1 tsp of salt. If your stock is very salty you may not need it. Taste again and add additional salt, if necessary. Add the gouda cubes, if desired. Bring the soup back to a simmer and allow it to simmer for a minute or two, until the cheese melts and disperses throughout the soup.